Governmental sources report that US Secretary of State John Kerry is behind the European boycott threats on Israeli products and companies operating in Judea, Samaria, eastern Jerusalem and the Golan Heights. Palestinian Authority (PA) officials reported last September that Kerry was putting pressure on the EU to delay boycotts so as to give him an opportunity to push Israel into peace talks. 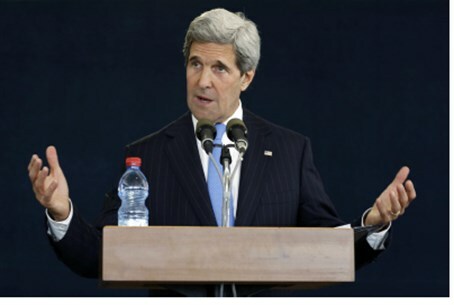 That report also appears to support the new revelations regarding Kerry's manipulation of anti-Israel boycotts. Defense Secretary Moshe Ya'alon said Tuesday that Israel was trying to extend the peace talks beyond the determined 9 months. "It is clear to us that there are large gaps [between us] - and this is not new - but it is certainly in our interest to continue negotiations and to continue to work to stabilize the situation in the relationship between us and the Palestinians," remarked Ya'alon. Meanwhile for the PA's part, a senior official recently was interviewed on Syrian TV admitting that any agreement will simply be the "first stage" in wiping Israel out completely. Israel has not been consistent in confronting the threat of boycotts. While Israel initially warned it might boycott the EU Horizons 2020 research program over the boycotts, eventually the government compromised by attaching a section to the program agreement saying the declared boycott guidelines are not recognized by Israel as legal precedent. Former MK Aryeh Eldad, head of Professors for a Strong Israel, accused the government in mid December of inviting more boycotts, such as that of the American Studies Association (ASA), by caving in on Horizons 2020. "Do they expect that if we continue to give in, then the boycotts will stop?" remarked Eldad, noting that leftist professors in Israel have been active in encouraging international academic boycotts. "Israel has been negligent up until now and dragged its feet when the first signs of a boycott of products from Judea and Samaria emerged. It declined to indict those factors who called for the boycotts, and now we are paying the price," charged Eldad.